Several players on the Indianapolis Colts said they support openly gay NBA center Jason Collins, and would welcome a gay teammate in the NFL. The Indianapolis Star went inside the locker room of the Indianapolis Colts to get the NFL players' reactions about NBA center Jason Collins coming out, capturing several of the players on video applauding Collins and saying they'd absolutely support a gay teammate in the NFL. 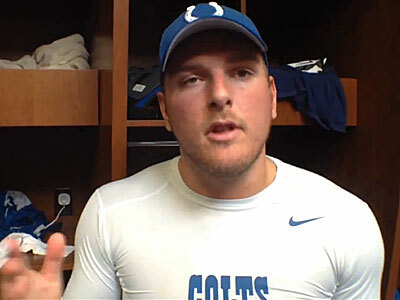 The Star spoke with punter Pat McAfee, wide receivers Reggie Wayne and T.Y. Hilton, defensive end Cory Redding, and cornerback Greg Toler, who were unanimous in their support both for Collins, and for an openly gay teammate. McAfee said he believes opposition to openly gay athletes is a generational issue, noting that younger players in the Colts locker room are more likely to be familiar with gay people in their lives as friends and family members. He said he would welcome a gay teammate, as would his fellow Colts. "We think it's a much bigger deal in the media than it is in the locker room," said McAfee. "I think if you're willing to work, and you're willing to grind, and you're a good player and you're willing to study film, I think we're completely OK with you being a part of our team. That's the way I look at it, and I'm sure there are plenty of guys in the locker room that feel the same way — a large majority." Wide receiver Wayne said that he doesn't know Collins personally, but noted that "if that was happening on our team, I'd definitely support him as a person first. I'd definitely have his back, and then at the same time, support him as a teammate," Wayne continued. In the wake of Collins's announcement, which made him the first openly gay male athlete currently playing a major team sport, former Dallas Cowboy Tony Casillas said Monday that he played alongside teammates he knew were gay in the NFL in the 1990s. Casillas also spoke about the macho "gladiator" mentality in the locker room and how that might have affected gay players. But if the Colts' statements are any indication, it seems that mentality has softened in recent years. Watch the players come out in unanimous support of a hardworking, openly gay teammate, below.